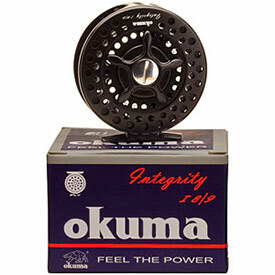 Okuma Integrity fly reels make large arbor performance available to all interested fly anglers. 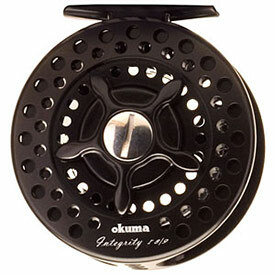 The Integrity I 7/8 Features a patented oversized stainless steel-based disc drag housed in a die-cast aluminum frame. The one-way roller bearing operates on a precision machined stainless steel spool shaft, complimenting Integrity's fierce structural integrity. Flat black color is utilitarian in nature, as Integrity makes its mark as a workhorse rather than beauty contestant. Fly Line Capacity: WF-8, 100 yds / 20 lbs. Your Payment Includes FREE Shipping. Sorry, we only ship to the United States. WI Orders: 5.5% Sales Tax. Merchandise is brand new unless noted; great condition, great price! We mail USPS, mail signature required. If item is over $300.00, international money order or bank wire transfer is required, with 3-day item inspection period. If not satisfied, we will refund your money, less a small restocking fee. Pay to: sales@esalesusa.com. If sending a check or money order, please remember to write the name and product/s you want, and mail to: eSalesUSA.com, PO Box 259663, Madison, WI 53715-9663. Thanks!